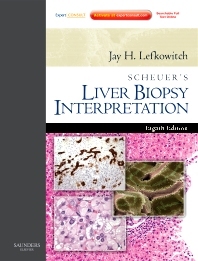 For over 40 years Scheuer’s Liver Biopsy Interpretation has been an invaluable resource for the pathologist in practice and in training in helping to solve diagnostic problems at the microscope. Lavishly illustrated in full color throughout it covers all aspects of liver pathology from the normal, the hepatidities, childhood disease and neoplasms. Copious technical tips and diagnostic 'pearls' reflect the extensive experience and insight of the late Peter Scheuer and Jay Lefkowitch.. Throughout the text histopathologic features are correlated with clinical features to provide a practical account of how pathology impacts the diagnosis and management of liver disease. Well written, complete and concise quick reference.Helps the practicing and trainee pathologist solve diagnostic problems at the mircroscope. High quality color images complement the text throughout.Provides the user with a complete visual guide to each entity and assists in the recognition and diagnosis of any tissue sample under the microscope. Practical tips and “hands on” advice from two of the world’s leading experts in liver pathology. Provides the trainee and general surgical pathologist with time saving diagnostic clues when dealing with difficult specimens. Glossary of frequently used terms and descriptions used in the pathology report contained at the end of the book. Useful quick reference for trainee pathologists and clinical hepatologists who may be unfamiliar with many of the terms and descriptions. Will assist in the writing and reading of a pathology report. A selection of a few general reading references at the end of each chapter.Directs the trainee or practitioner to the most relevant and authoritative sources of further information and study.